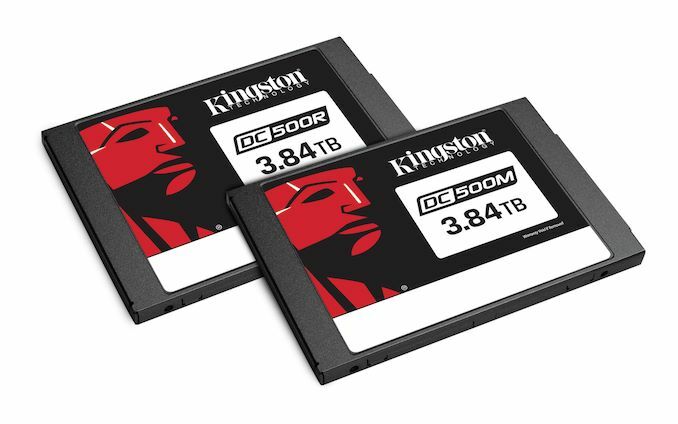 Kingston is making a renewed effort in the enterprise storage market this year, starting with the launch of their DC500 family of enterprise SATA SSDs. The new DC500R and DC500M product lines are designed for read-intensive and mixed workloads respectively, with endurance ratings of 0.5 and 1.3 drive writes per day, respectively. The target market for the DC500 family is second-tier cloud service providers and system integrators. The biggest cloud companies (Google, Microsoft, Amazon, etc.) have largely moved over to NVMe SSDs, but among the smaller datacenter players there is still a large market for SATA drives. These companies are already Kingston's biggest customers for DRAM, so Kingston already has a foot in the door. The DC500 family continues Kingston's close relationship with Phison, incorporating the new Phison S12 SATA SSD controller. This provides all the usual features expected from an enterprise drive, including end-to-end data path protection, Phison's third-generation LDPC error correction, and power loss protection. The NAND flash Kingston is using this time is Intel's 64-layer 3D TLC, rated for 5000 Program/Erase cycles. Kingston most often uses Toshiba flash, especially given their investment in Toshiba Memory Corporation, but ultimately Kingston is still an independent buyer of memory, and at the moment they consider Intel to be a better option for their enterprise SSDs. Performance ratings are typical for SATA drives with TLC NAND. Both the DC500R and DC500M will saturate the SATA link for sequential transfers or random reads. The DC500R's steady-state random write performance is rated for 12k-28k IOPS depending on capacity, while the DC500M with substantially more overprovisioning can sustain 58k-75k random write IOPS. Capacities for both tiers of DC500 will be 480GB up to 3.84TB. The DC500R is shipping starting today, while the DC500M will start shipping next week, except for the largest 3.84TB capacity that will arrive later in Q2. You said it right there: "Not sure if that would happen"
"The biggest cloud companies (Google, Microsoft, Amazon, etc.) have largely moved over to NVMe SSDs"